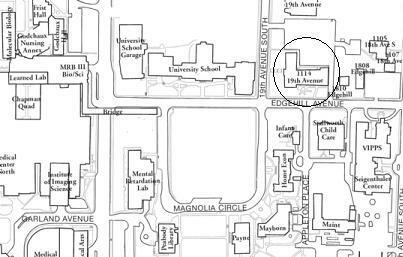 Click here for an interactive campus map centered on our building, 1114 19th Ave. S.
Click here to learn more about our collaborative space. The Center for Teaching (CFT) is located at 1114 19th Avenue South. Situated at the corner of 19th and Edgehill Avenues with the main entrance facing 19th Avenue, the CFT is just one block from the 21st Avenue pedestrian bridge, making it approximately a 7 minute walk from Central Campus and 3 minutes from the Commons. Zone 2 permit holders may park on levels 4 and 5 of the Wesley Place Garage, which is two blocks away on Scarritt Place. After 2:30 p.m. vehicles with any university commuter permit may park in any zoned lot. There are also a number of metered spots available in front of the building on 19th Avenue for those without Vanderbilt parking permits. The Wesley Place Garage on Scarritt Place also has pay parking.